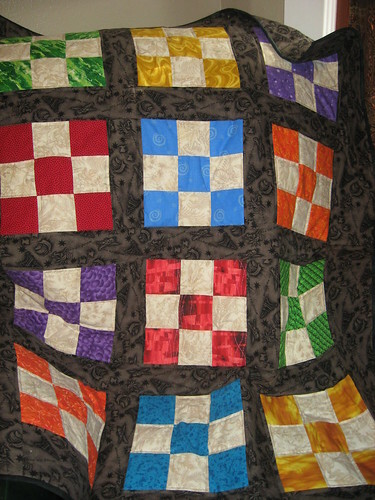 One of the quilts I'll be donating to the DK VA Hospital Support Project. I haven't decided on the second one yet -- maybe it will be a log cabin. Hi everyone. This diary is to check in with everyone who is making a quilt or quilts for the DK VA Hospital Support Project -- and to explain other parts of the project, as well. As some of you may know, Netroots Nation is being held in Detroit July 17 to July 20. There is a group set up, the DK VA Hospital Service Project. I am co-chair, along with Broths, to provide hand made scarves and hats for the vets. Sara R is chairing the committee overseeing the quilt project. 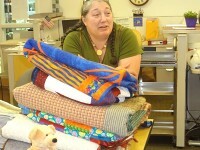 She wants to have handmade quilts for all the vets residing at the nursing home part of the VA hospital. Follow me below the orange squiggle for more on this. Quilts for Detroit VA Hospital Nursing Home - Be a Part of It!